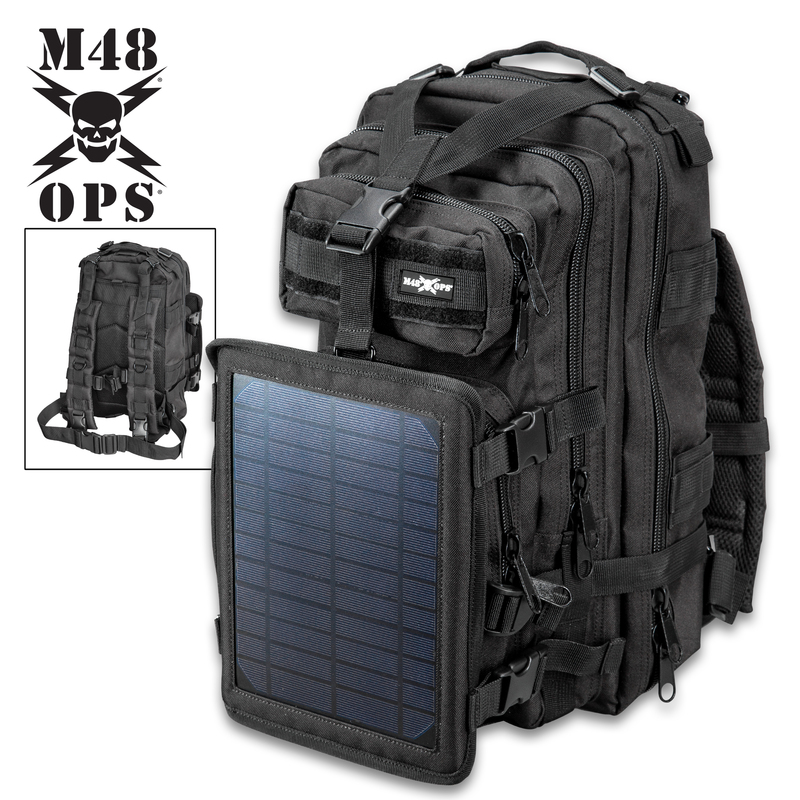 M48 OPS Tactical Solar Panel Backpack - Charges Device Via USB Port, Made of 600D Oxford Material, MOLLE Straps, ABS Hardware | BUDK.com - Knives & Swords At The Lowest Prices! 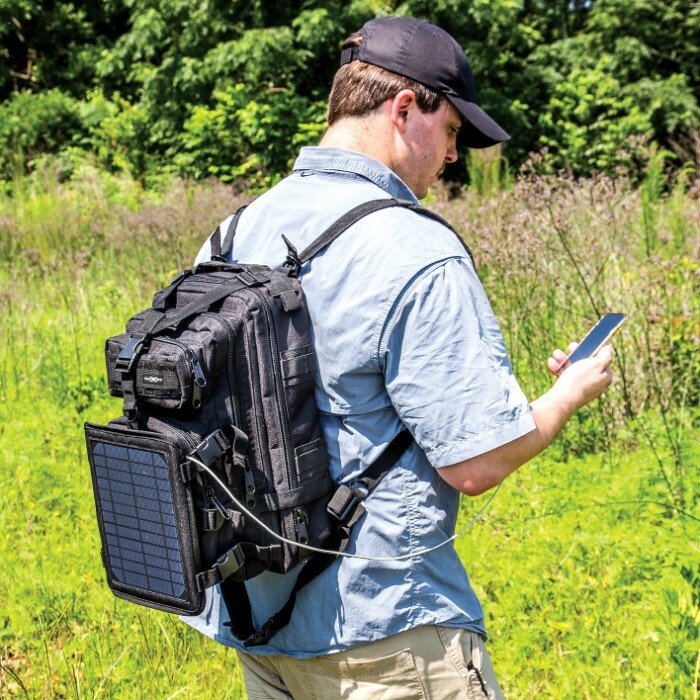 The M48 OPS Tactical Solar Panel Backpack lets you plug directly into the sun, an unlimited power source, to keep your smartphone or mini tablet charging wherever you are. 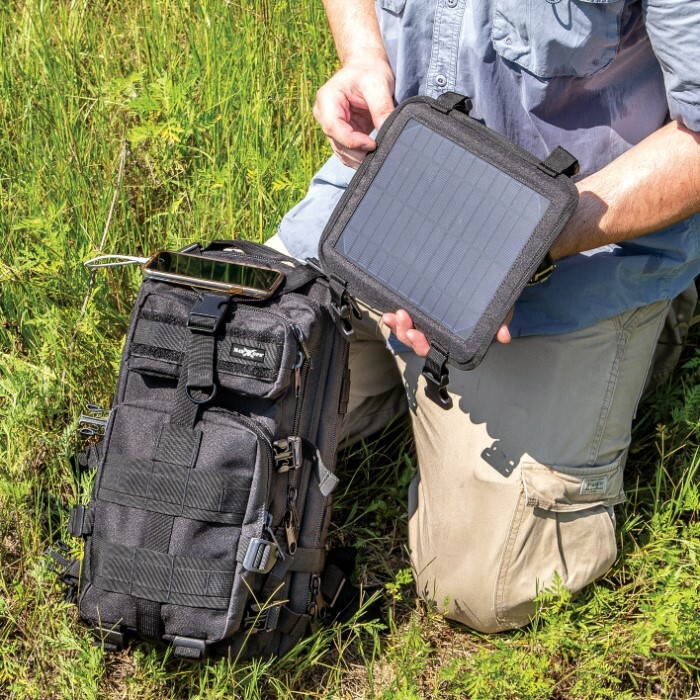 A high-quality, 8 1/2”x6 1/4” solar panel is built into a 600D oxford material frame, which has a mesh, zippered panel on the opposing side that serves to house a USB plug, plus, a smartphone or mini tablet. When you’re out under the sun, just simply plug in your device to the USB port, drop it in the zippered pouch and let it continuously charge while you’re out and about. The panel is attached to the front of the pack with ABS quick-release buckles, so that it can be removed if you want to leave the pack behind or attach it to other gear. 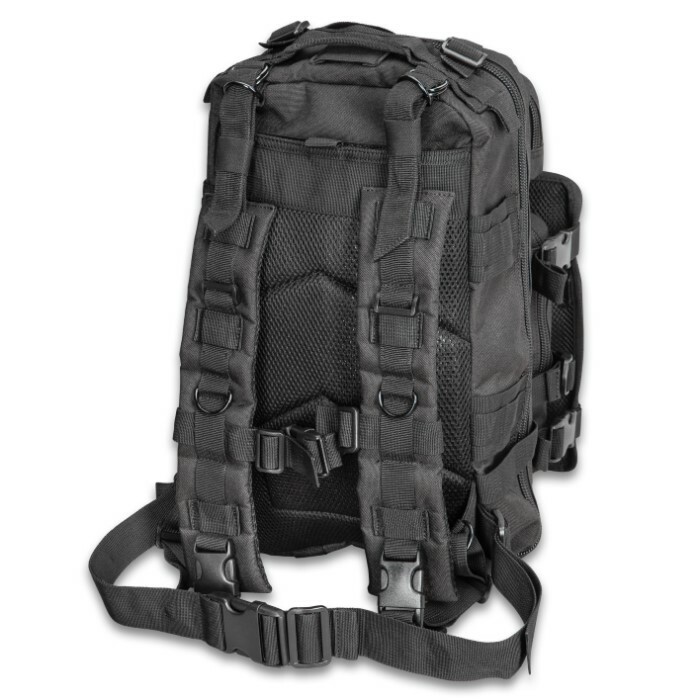 Constructed of 600D oxford material, the M48 OPS Tactical Backpack is extremely durable and has a main compartment with a big mesh pocket to keep items secure, as well as, a zippered pocket. 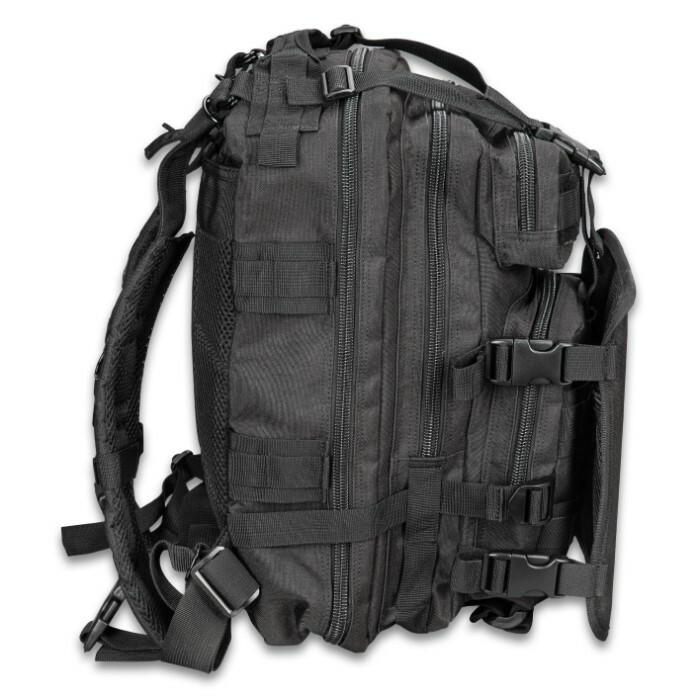 The back of the pack features adjustable, removable cushioned mesh straps and the front of the bag features MOLLE straps and two zippered compartments. 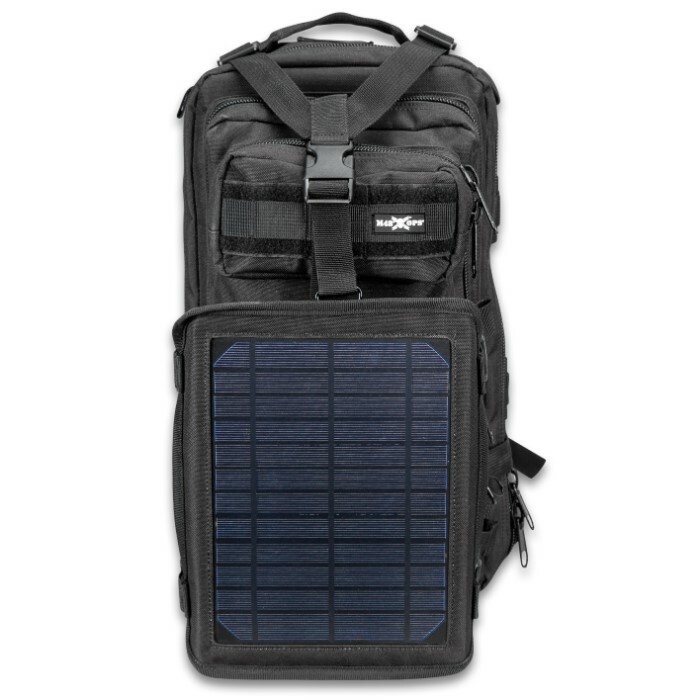 This solar panel backpack is perfect for a variety of uses including hiking, camping, traveling and as a bug-out bag. I was skeptical about how effective the solar panel might be at first but figured, hey at least I'd still have the bag but I'm SUPER FREAKING IMPRESSED! It was overcast outside and I was still getting a fast charge. I bought a power bank with mine because it doesn't hold a charge but if you get the power bank, the big panel will charge it and you can use the bank if it's not sunny outside or at night. I love this thing. Getting my husband one too for our camping trips. Nice job BUDK. The solar panel is the best! As soon as I stepped out the door my phone started charging and it kept charging all day long! All you need is sunlight. This bag is very spacious, I had plenty of room for everything I needed on my hiking trip this weekend. 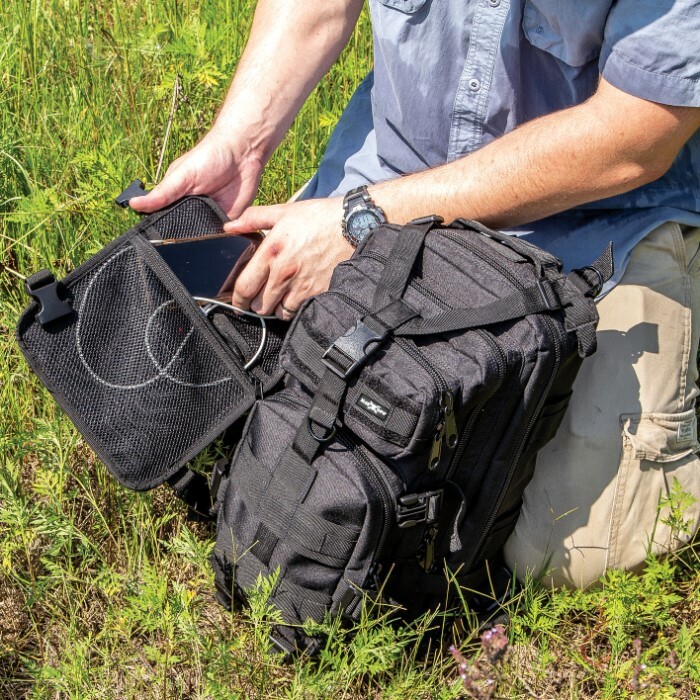 This bag has come in handy multiple times on many camping trips!